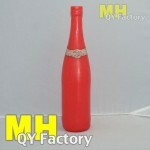 Wax Surprise Bottles | SkyLanterns, Hanging Lanterns, CandleBags. Wax Surprise Bottles, fill with paper hearts, a stuffed toy, soap roses or anything you please. Can be a lovely surprise gag for a loved one. Can be used as a gag gift for those who are stressed or get angry (something to break). Figurines or anything sculpture-like in nature can be created. 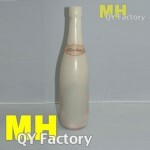 Bottle are designed to be broken safely as wax has no sharp edges. With the proper mix of hardener thee bottle will endure the heat of summer. A unique item that can serve as a memorable promotional item for companies wanting to do giveaways (Hidden in the bottle). For your quote, contact us.